Help keep open hardware alive and well by sponsoring the OHS! Today, we have a call to action for all makers, hackers, hobbyists and electronics enthusiasts who value the ideology and/or benefits of open source technology - Help Support the Open Hardware Summit! 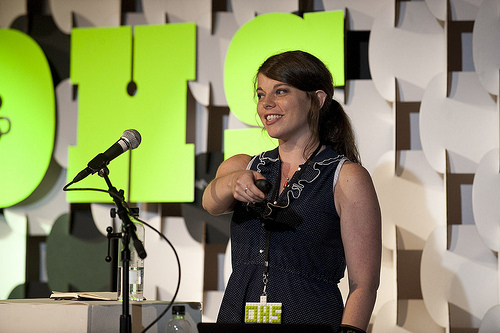 Speaking at the 2012 OHS. One of the key tenets of SparkFun Electronics' philosophy is our belief in open source technology. All of our designs are open source, and we think an open market is a healthy market. Our CEO Nate even gave a talk about it at Boulder TEDx. Attendees from last year's summit. The Open Source Hardware Association is one of the most important and influential players in the open source world. Every year, they hold the Open Hardware Summit - the world’s first comprehensive conference on open hardware. It's a venue to discuss and draw attention to the rapidly growing Open Source Hardware movement. This year, the event will be held September 6, 2013 at MIT. Speakers include world renowned leaders from industry, academia, and the maker community. The OHS keeps open source tech healthy and moving forward - and SparkFun is proud to be a sponsor. But the summit relies on forward-thinking donors to help cover costs so they can keep ticket prices low, and ensure they can offer an accessible forum for open hardware enthusiasts. Now they need your help! SparkFun's Director of Engineering Pete Dokter (left) at the 2012 OHS. Whether you can only sponsor at a lower level, or you want to go all-out, every bit helps. 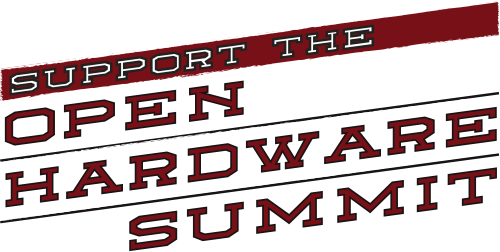 By sponsoring the Open Hardware Summit, you are actively making a difference in the world of Open Source and ensuring that open source tech will continue to be available for years to come. OSHWA - and SparkFun - thank you! Isn't there a way of funding the open hardware summit by selling hardware? Perhaps we (OSHWA) could convince OSHW businesses to donate a % from each sale. A very cool idea! But currently, OSHWA doesn't make any revenue: it's a not-for-profit. We helped out but OSHWA needs some love from other companies as well. It's really timely that you're discussing this, for the next iteration of the Open Source Science Tricorder project I've actually drafted a CC-BY-SA derived license that's been modified both with much of the same IP language found in TAPR/CERN, and with the requirement that for for-profit use, 10% of the profits must be donated to a basic literacy or science education charity (though I think in the final version this will also allow a split between science/literacy charities and the EFF and/or OSHWA). Since a lot of folks are already using CC-BY-SA for open hardware, my hope is that this could be a drop-in replacement. I sent the draft to Alicia earlier this week to get OSHWA's comments -- I can send a copy your way if you'd like? I'm particularly interested in the charitable contribution percentage (10% net), and whether that's a realistic number given typical margins. In the end the benefit in the form of charitable contributions are only as useful as the adoption rate of the license. Honestly I would love to attend representing Industrial ARMWorks as we are very interested in going Open Hardware/Open Source Software as much as possible. For several years we have sponsored the top tier kernel experts to get the Linux kernels for Samsung ARM chips mainstreamed. (With Linus living not far away, it would be embarrassing to run into him and not be open source). But a flight from the West Coast and the East in summer sounds terrible at a time when business is picking up and school is starting. We are very busy with computer science/EE faculty members and new OEM inquiries in September. In fact, by then we are already planning manufacturing to adjust for the Chinese Lunar New Year. Make it to the potlatch or not, we plan to join. I didn't speak at the OHS last year but our fearless guidance counselor Mike Hord spoke about when open source meets FCC. He had some very good pointers. Alicia Gibb is the President of OSHWA, and actually the Summit has a review system for selecting speakers. Windell Oskay from EMSL is in charge of that this year (http://2013.oshwa.org/about/). If you'd like to be a reviewer in the future, let the review chair know! Please come! I'd love to meet and chat about how open source make businesses healthier. If the fall semester gets in the way we understand. We've got a lot of people on the road teaching and once September starts it's hard to get schools to let us swing through.